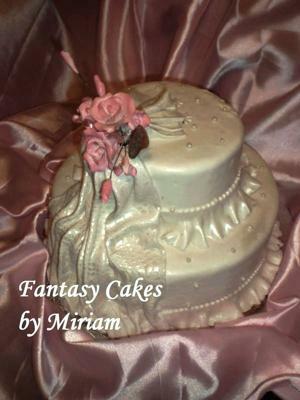 This small wedding cake consists of one 10" and 6" (double tiers) cakes. They are filled with Almond Cream and Strawberry Mousse. I sealed the crumbs with thick layer of Italian Buttercream. I covered them in white fondant (very thin so the buttercream taste will prevail over the fondant's). For the drapes I placed a plastic dolly and pressed it against the fondant using a small rolling pin, brushed pearl dust before taking the dolly off. I made the ruffles by cutting a one and a half wide fondant strips and rolling a cocktail pick back and forth on the border to create the frills. I prepared and assembled the ruffles (using sugar glue) before preparing/assembling the drapes. The final touch was a small rose spray. I BET IT TASTED GREAT TOO! Anonymous, thanks for your positive comment. This is absolutely georgeous! Looks like it is draped with satin. Truly elegant! Way too pretty to cut!